GOVERNORS ISLAND — Want to feel like you’re getting away without going too far this summer? Hop on a short, $2 ferry ride and transport yourself to Governors Island — the city’s quirky, relaxing oasis in New York Harbor. Whether you want to just lay out on acres of picturesque parkland — perhaps in the hammock grove — have a day of hiking, biking or kayaking, or take in some arts and crafts and munch on some gourmet food truck fare, Governors Island has a day of leisure waiting for you. The island, which is open seven days a week, features a host of programming for all ages every single weekend. Below you’ll find a taste of what’s on tap this summer, but check out Governors Island's website for the full list of events. For tech-lovers of all ages, new to the island this summer will be the Makeground, run by The Makery — an organization that lets the young and old play with 3D printing technology. One of the island’s historic homes will be transformed into a digital playground. Also new this year is an exhibition by the Billion Oyster Project, which will give visitors a chance to learn more about its mission to restore a billion oysters to the New York Harbor. As another new addition to the summer calendar, The New York Historical Society will take over one of the historic homes on the island for its new exhibit, "Revolution: NYC & the War for Independence." A longtime naval base, the island also hosts hiking tours showing off its military history seven days a week. Also new this year are water fountains. Adults and kids can run through the water spouts at Ligget's Terrace, or simply sit back and enjoy the dancing water show. Plus, there's a new furry resident on Governors Island, Max. The adorable Border Collie is there to keep geese away, but he'll also greet you on the island, if you're lucky. The island offers 5 miles of car-free roads to bike or walk along. On weekdays, there are free bike rentals from 10 a.m. to noon. Otherwise visitors can rent bikes or bring their own. If you love getting out on the water, City of Water Day, on July 18, will be a good date for a trip to the island. Free kayaking, fishing demonstrations, boat tours, paddle boarding and other water-related fun for all ages will keep you going from 10 a.m. to 4 p.m.
With a New York State fishing license, catch-and-release fishing is also permitted on the island throughout the summer. For some quirky active time, head to the Come Out & Play Field Day on July 18, from 11 a.m. to 5 p.m. It's an annual festival that turns part of Governors Island into a playground for adults, with whimsical street games like Full Contact Catan, the Settlers of Catan game re-imagined as a contact sport. A kids version, the Come Out & Play Family Day, also runs simultaneously. Arts organization FIGMENT takes over the island with a host of whimsical exhibits, sculptures, interactive designs, games and programming on June 6 and June 7, but they also host summer-long programs and exhibits, including an arty mini-golf course, interactive sculptures and even a tree-house. For Shakespeare fans, check out a fun, fast romp through a 15-minute performance of Hamlet, presented by Hedgepig Theater Ensemble on June 20 and 27. The annual Jazz Age Lawn party, which encourages dress and dance from the 1920s and 1930s, is back on June 13 and 14, as well as August 15 and 16. From 11 a.m. to 6 p.m., enjoy music, food, drinks and fun from the flapper era. Tickets must be purchased in advance as they often sell out. For those who love free wheeling, the New York Unicycle festival returns Sept. 5 and 6. You can watch hundreds of unicycle enthusiasts in action, or learn to ride and participate in games. 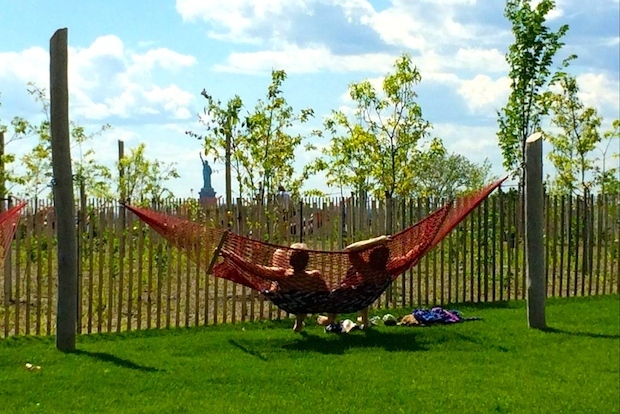 Governors Island is open seven days a week now through Sept. 27. For more information, head to Governors Island website.